ACRYLIC BOOK. 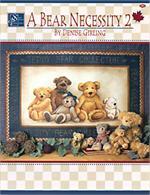 Bears are the theme throughout Denise's adorable book. There are so many cute designs you will want to paint, paint, paint. The Teddy Bear Collection floor mat is a would make a wonderful accent to a childs room or that special area where the teddy bear collection is kept. This design is also makes a darling wall hanging. Born to Paint, Forced to work is straight to the heart and something we all wish, it is painters must. 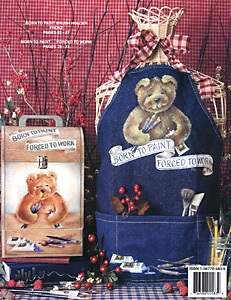 Denise has painted this charming design on a denim apron and brush tote that you will want to paint and wear, store your brushes in and carry to class or just display in your painting space. The Easter Bear & Puppy is so very delightful you will want to hang it year round. 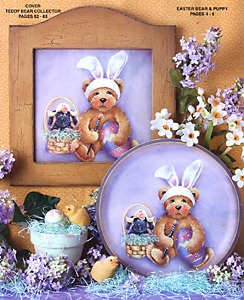 Denise has painted a cute bear wearing bunny ears, next to an Easter basket with a little black dog wearing a yellow duck hat, this is a cute design. Tender Loving Nurse Bear is a sweet bear dressed in a nurse apron and hat, with a black puppy adorning a bandaged arm and head. 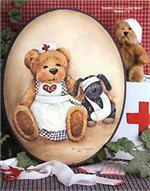 If you are a nurse or have a friend that is a nurse you will want to paint this design. 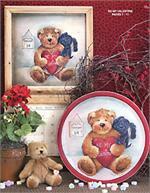 Be My Valentine is a heart warming bear holding a red valentine heart, cuddled by a black puppy. The Cat Chow bin would be the perfect painted bin to hold you favorite kitties food. Oh Canada banner is painted with bear wearing a Canada Day shirt, Canadian flag flying and a fluffy black puppy companion. God Bless America banner is painted with a bear wearing a star shirt, American flag flying and a fluffy black puppy companion. Give Thanks bear will brighten this fall holiday with the cutest of designs. 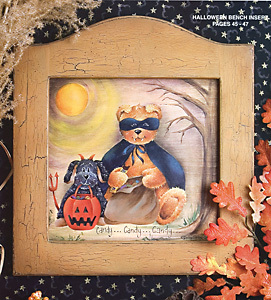 Denise's Halloween design will tickle the painter in you to create this piece that you will want to bring out every Halloween, it is a bear with a black cape and mask, along with a black puppy holding a happy pumpkin trick or treat bag. 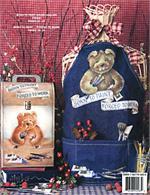 At The Lake is another adorable design painted on a picnic basket and wooden oval. The scene is a bear on a log in the great outdoors roasting a hotdog over a campfire with a fellow fluffy black dog friend. These are just some of the delightful, adorable, cute projects that you will find in A Bear Necessity 2. This book is a winner.